The light and the obscure, the sky and the earth, the ethereal and the corporeal. Such juxtapositions have long formed the essence of the photographer’s art and a mastery of these elements can evoke entire universes of nuance and emotion. Oliver Mark (b. Germany, 1963) is one of the modern geniuses in the use of these elements; and Alvin Langdon Coburn (b. America, 1882; d. Wales, 1966) possessed such a gift in their use that his work forms the foundation of pictorialist photography. 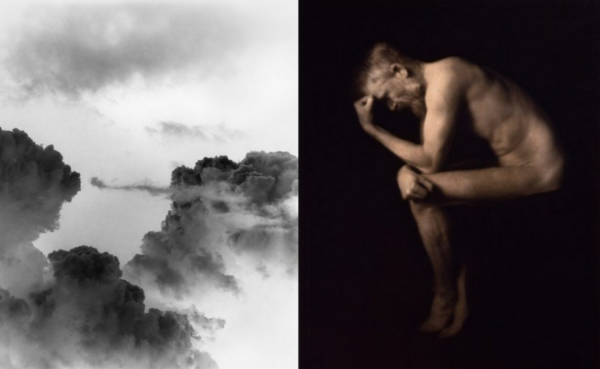 CLAIR Gallery curated an exhibition, Between Skies and Earth, that explored the overt and covert connections between these two celebrated photographers who are separated by more than a century. CLAIR Gallery presented Between Skies and Earth from March 30, 2017 to June 11, 2017 at Franz-Joseph-Strasse 10 in Munich. Oliver Mark is renowned for his portraits of aristocrats, artists, and celebrities. His work has been published in magazines such as Vogue and Vanity Fair, while his photographs have been exhibited in museums around the world. More information available at his artist page or on his personal website. Alvin Langdon Coburn was a pioneering figure in photography and an early master of pictoralism. He began taking photographs as a young child and his career spanned more than six decades. His work bears witness to the rise of the great modern cities and he was fascinated by the dynamic complexity of these new urban environments. Coburn had a particular genius for photographing movement, whether it be the eerie play of artificial and natural light at nightfall in New York City or the traces of pedestrians seen from a perch high above a London park. To see more of his work, visit his CLAIR artist page. Posted in Events & Exhibitions .